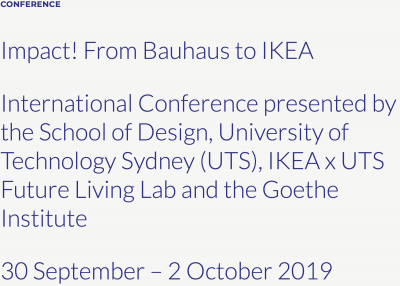 International Conference presented by the School of Design, University of Technology Sydney (UTS), IKEA x UTS Future Living Lab and the Goethe Institute, taking place at UTS, Sydney, from the 30th September until 2nd October. One hundred years after its founding in Weimar, this conference traces the transnational impact of the Bauhaus on the history of the future of design. As a workshop of modernity and a laboratory of the future, the Bauhaus changed everyday life through design: from single objects to buildings and cities. The Bauhaus set into motion a democratisation of design that is reflected today in all aspects of the objects we use and the spaces we live in. The conference welcomes papers from a wide range of historic and contemporary perspectives, including design theory, architecture, interior architecture, product design, design school pedagogy, art history, visual and textile studies. Please submit a 300-word abstract referring to one of the four thematic sections and sub-sections and a 100-word biography by 15 April 2019.